Waiting for the bus in downtown Winnipeg just got more interesting. 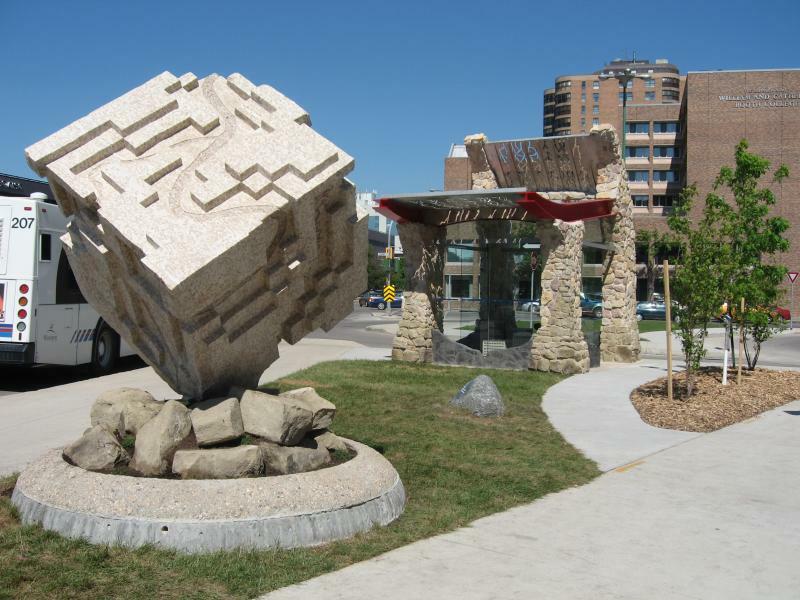 city.block.stop is an artist-designed transit shelter and sculpture by Winnipeg artist David Perrett. 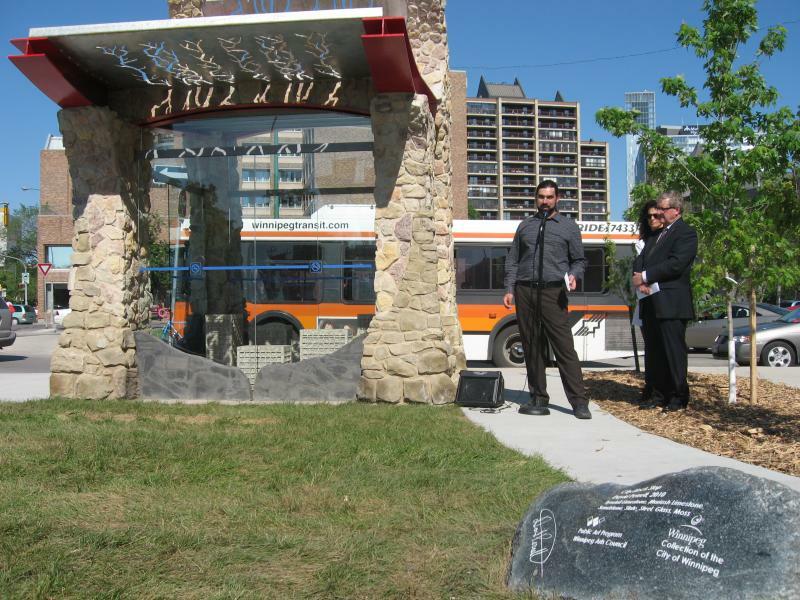 It is the first transit shelter in Winnipeg designed exclusively by an artist. 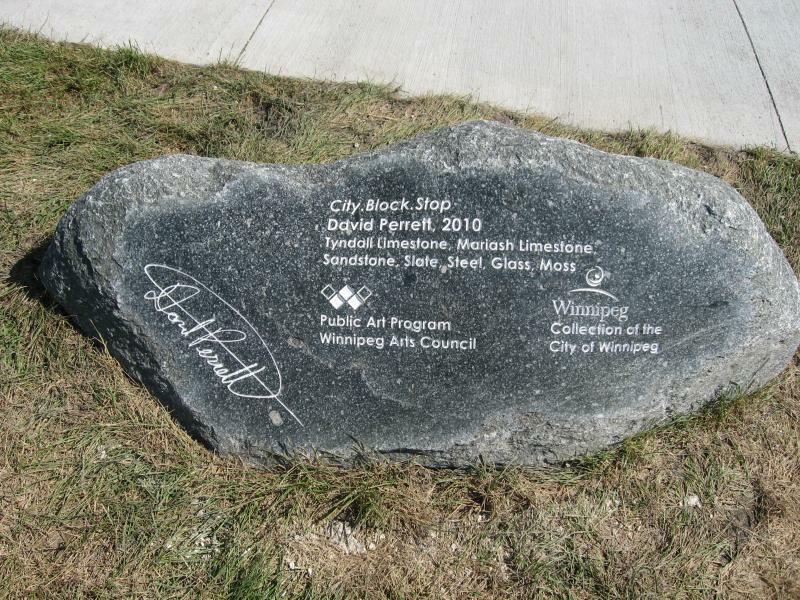 Conceived as a “gateway” to the campus, the artist worked closely with the University of Winnipeg community and with Winnipeg Transit. 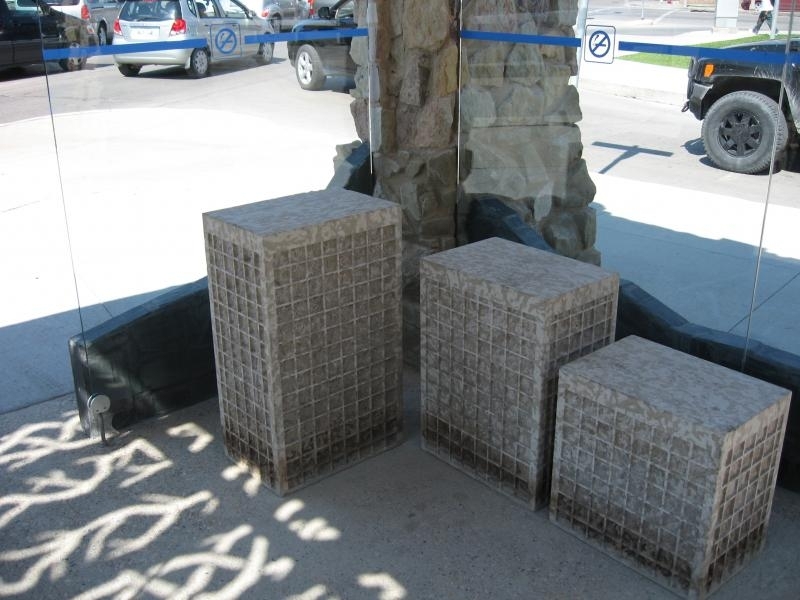 The shelter features local mortared stone, including sandstone reclaimed from the University of Winnipeg’s historic Wesley Hall, sculptural seating and an ecologically green moss-covered roof accented by laser cut screens. 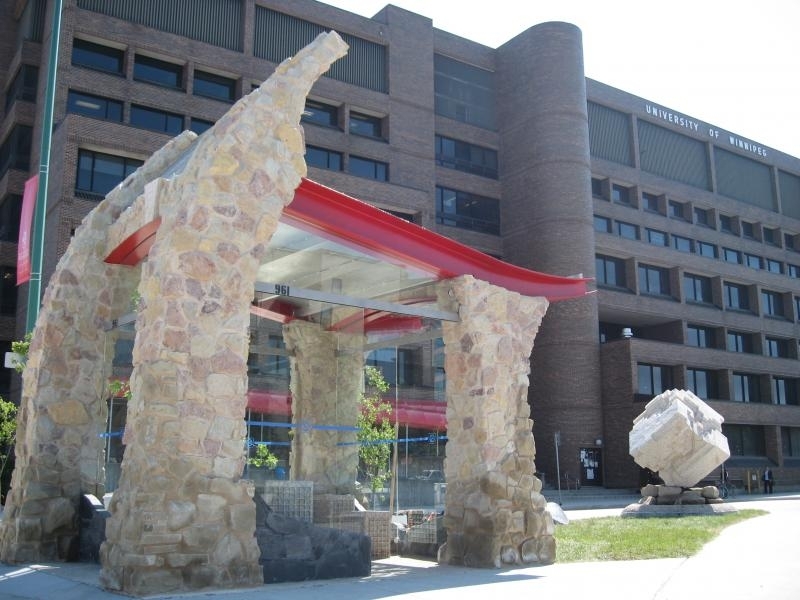 The related Tyndall stone sculpture is inspired by the geography of the city, carved to represent the Red, Assiniboine and Seine Rivers and the surrounding topography. 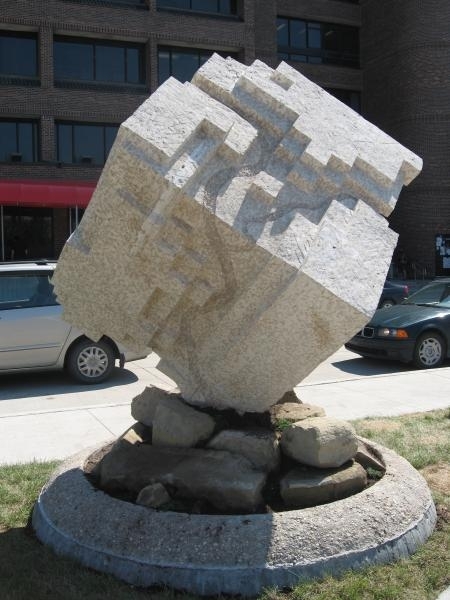 Perrett carved the 16,000 pound Tyndall stone cube in situ over the summer and fall of 2009. The roof of the shelter was planted with moss harvested in rural Manitoba. 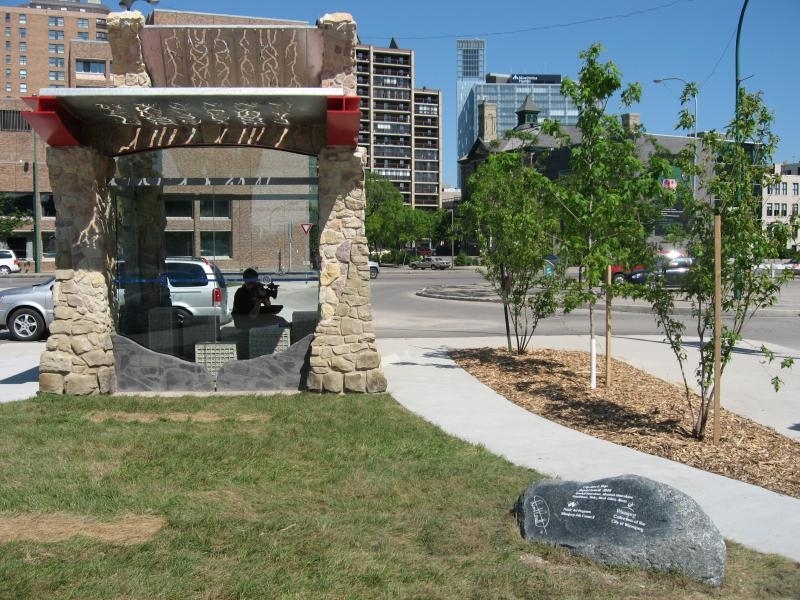 “The shelter design was created borrowing elements from both nature and Winnipeg architecture. With four open sides, the shelter gives an inviting atmosphere and takes advantage of the ample direct and indirect sunlight at the site. The carving on the sculpture is an adaptation of the cityscape that shows the rivers seemingly rejoining each other as they wrap around the six-sided cube,” said artist David Perrett. 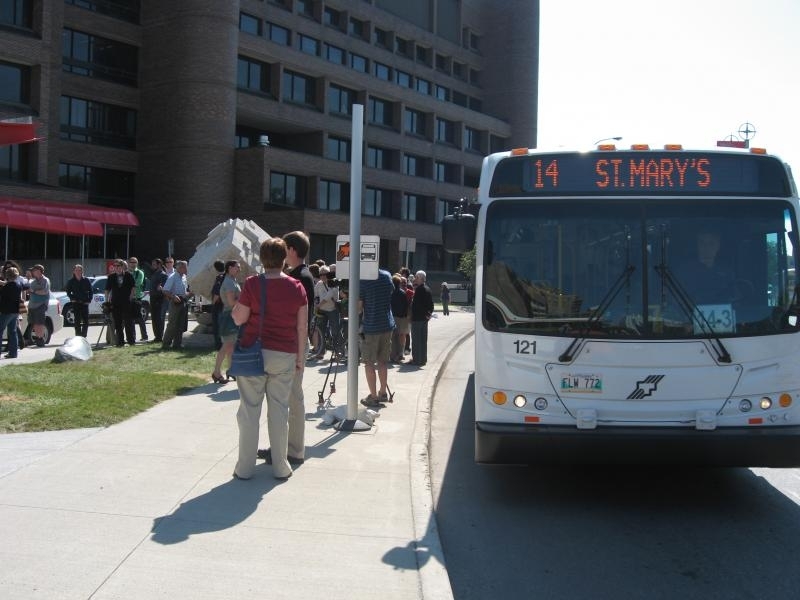 The project was commissioned through a regional Call-to-Artists that sought an artist to create a transit-focused gateway to the University of Winnipeg that would reflect elements integral to the University’s campus redevelopment plan including sustainability, ecology, University heritage and meaningful way-finding. David Perrett is a Winnipeg artist who received his BFA from the University of Manitoba in 2003. He has created works in many media including drawing, photography, sculpture and installation. Much of his work is influenced by years spent exploring the Canadian wilderness as a canoe and hiking guide. Landscape and cartography have become central components in his artwork and David draws inspiration from both wilderness and urban environments. His sculptural works use “natural media” such as stone, soil, and live plants. By blending them with architectural and cartographic images, he explores the relationship between people and both pristine and man-made landscapes. David prefers to use local materials and apply them in unexpected forms and places to create works that are both familiar and surprising. This commission is David’s first permanent public art project.